If you receive a payment claim under the Building and Construction Industry Security of Payment Act 2002 (Vic), you have limited time to prepare a payment schedule. This article explains how to do it. 1. Be on the lookout for payment claims. A payment claim made in Victoria must state that is a payment claim made under the Act. A statement along the lines of “This is a payment claim under the Building and Construction Industry Security of Payment Act 2002” should appear somewhere on the payment claim. indicates the amount of the progress payment that the claimant claims to be due. Since you will only have a limited amount of time to deal with the claim, you should have a system in place to ensure that any payment claim that arrives is promptly brought to the attention of someone who will be in a position to deal with it. the time prescribed by the contract, whichever time expires earlier. The manner of service is critical. Once you have worked out how your response must be sent, you can work out how long you actually have to consider and prepare your response to the claim. Always check the terms of your contract to see what methods of service are permitted. Also check section 50 of the Act, which may give you additional options. If you do not serve your payment schedule on or before the due date, the claimant may have the right to recover the entire amount of the payment claim, as a debt, among other options. It is therefore critical to ensure that your payment schedule is served on time. After you have worked out when and how your response will be sent, it’s time to start considering the substance of the claim. Just because a claim purports to be a payment claim under the security of payment legislation, this does not mean that it is necessarily a valid claim. If the claim is not a valid payment claim, the claimant will not have any rights (and you will not be exposed to any liabilities) under the Act. is served on the right person. 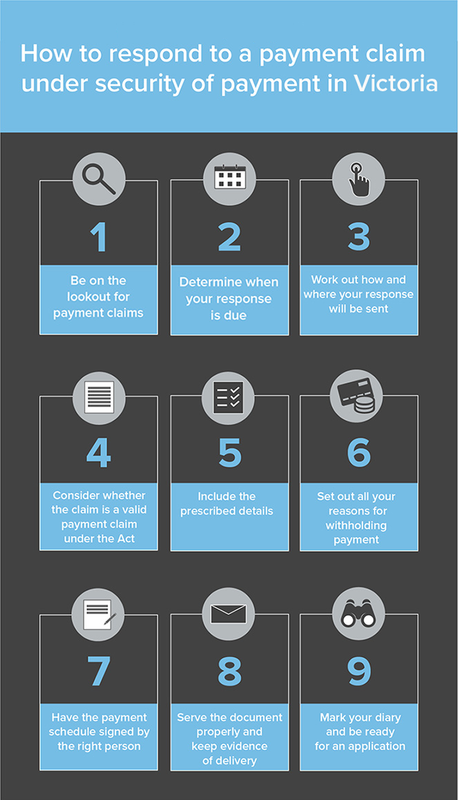 Determining whether a payment claim meets these criteria is not always a straightforward process. If in doubt, assume that it is a valid claim and that you are required to prepare a payment schedule. Be aware that even if it is not a valid claim under the Act, it may still be a valid claim under the construction contract. any claim arising at law other than under the contract. If the payment claim includes an excluded amount and it proceeds to adjudication, the adjudicator may not consider the excluded amount. Any determination that takes into consideration an excluded amount will be void to the extent that it does so. A dispute about an excluded amount may be resolved in accordance with the dispute resolution clause of the contract or by going to court. If the scheduled amount is less than the claimed amount, you must set out your reasons for withholding payment. your reasons as to why you do not agree to pay the amount claimed, or part of the amount claimed. Your reasons for withholding payment must be sufficient to enable the claimant to understand why you are withholding payment. the technical legal issues, such as time bars in your contract, or provisions that operate as preconditions for claiming payment (such as the giving of contractual notices). If more than one reason applies to the same item, include them both. If you don’t include a reason for withholding payment in your payment schedule, but raise it later in response to an adjudication application made by the claimant, the adjudicator must notify the claimant of those new reasons and allow them two business days to respond. If the adjudicator does not provide the claimant with the opportunity to respond to your new reasons, any subsequent adjudication determination may be capable of being challenged due to a lack of procedural fairness argument. The person required to issue a payment schedule is the person upon whom the payment claim is served (i.e. the person liable to make the payment). It’s possible for someone else to issue a payment schedule on behalf of that person, such as a superintendent or a solicitor, provided that person has been authorised to do so. Following the principles discussed earlier, make sure the payment schedule is delivered in the right way and by the deadline. If you are sending documents to a physical address, check the payment schedule and the contract to ensure you are sending the payment schedule to the right place. If you are dealing with a corporation, consider conducting an ASIC search to ensure the address is current. If you have multiple addresses to choose from and you’re not sure which one to pick, it may be worth sending the payment schedule to all of them. Serving the document multiple times would be better than running the risk of not serving it properly at all. If you think the claimant is likely to apply for adjudication, mark your diary for the date that is 10 business days after the date you deliver the payment schedule. That is the last day the claimant will have to make an application. If an adjudication application is made, you will only have 5 business days to prepare your response. Consequently, if it looks likely that you will receive an adjudication response, you should consider seeking legal advice at the earliest opportunity to ensure you have enough time to compile your best possible defence to the claim. Bridgit is a commercial lawyer whose practice is focused on transactional matters in the construction and technology space.